The Mazzanti Evantra millecavalli is the most powerful road-car ever built in Italy. It has a unique 7.2L twin-turbo V8 producing 1000 hp (986 bhp) and 893 lb-ft of torque which is all directed to the rear wheels through a 6-speed sequential gearbox. Weight is around 2,866 lbs (below 2.9 lbs/hp), 0-60 mph happens in under 2.7 seconds while approaching a top speed of 250 mph. Basically every stat beats a LaFerrari. Once the lighting elements are redone then I think the look will work perfectly. Mazzanti has kept to building only five of the 7.0 LS7 powered Evantras annually since 2013. I think it started with 701 hp, bumped up to 751 hp, and currently there is an Evantra 771 with 20 hp over the Evantra. I believe all of the variants are rocking sub 3.2 second 0-60 mph times and 224 mph top speeds. The Evantra millecavalli has a production run of 25 units which will be built along side the five yearly Evantra production. This means that there could be about 50 Evantras and 25 Millecavallis in the world by 2022 at this rate. 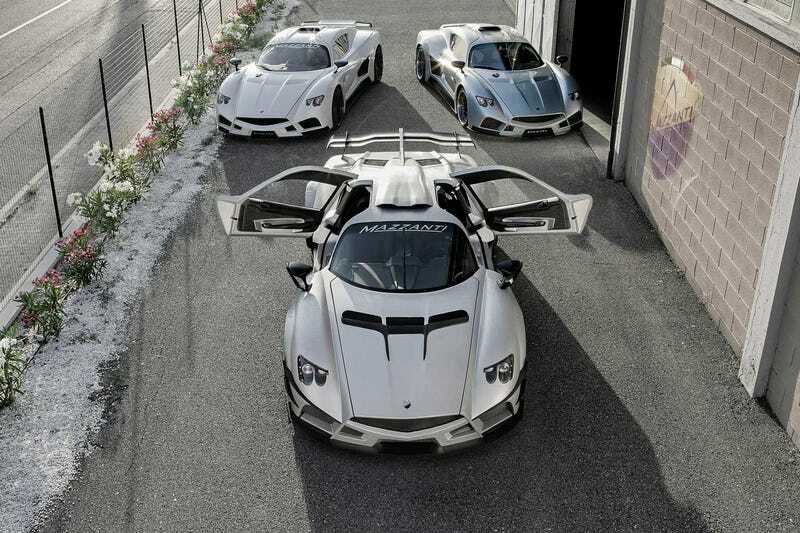 I said it before, if BMW would take Mazzanti and Mercedes would grab Pagani then we could have an awesome extreme Italian hyperexotic quartet between Ferrari, Lamborghini, Pagani, and Mazzanti (though the last two are splitting the Fezza/Lambo and Koeni/Buga segments). Here’s a prototype of something running away.